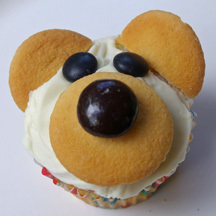 These bear cupcakes are super simple thanks to Nilla Wafers! What You Need: 1 cupcake; white or off-white frosting; 2 Nilla Wafers; 1 Junior Mint; 2 black or dark brown M&Ms; knife. How to Make It: Frost cupcake. Place Nilla wafer cookie toward bottom of cupcake for muzzle. Use dab of icing to adhere Junior Mint nose about 2/3 from bottom of cookie muzzle. Add M&M eyes. Cut another Nilla Wafer in half and place halves at top for ears. This entry was posted on Saturday, June 6th, 2009 at 12:08 pm	and is filed under animal cupcakes. You can follow any responses to this entry through the RSS 2.0 feed. Responses are currently closed, but you can trackback from your own site.